Why is the Saints' offense so good? There are obviously a number of reasonable answers, but aside from the usual suspects--Payton, Brees, talent identification and acquisition, excellent cap management, etc.--what stands out most is the multi-dimensional offensive model that Payton has developed the past six seasons. The offense is littered with a collection of players whose individual strengths highlight their contributions to an all-world offense. And while Brees and the offensive line make it all work, the composition of surrounding parts provides an offensive diversity that's unmatched in the NFL. The toppling of records is no accident. Sean Payton's ideology focuses on collecting the widest variety of options available, and ensuring that he has a tool for every task. It goes far beyond the simplistic philosophy of acquiring players based solely on speed, size, collegiate pedigree, or whatever else. Payton's offense functions more like a jigsaw puzzle whose pieces--when viewed in isolation--might not look quite right, but when fused together form a composite that is wildly difficult to defend. 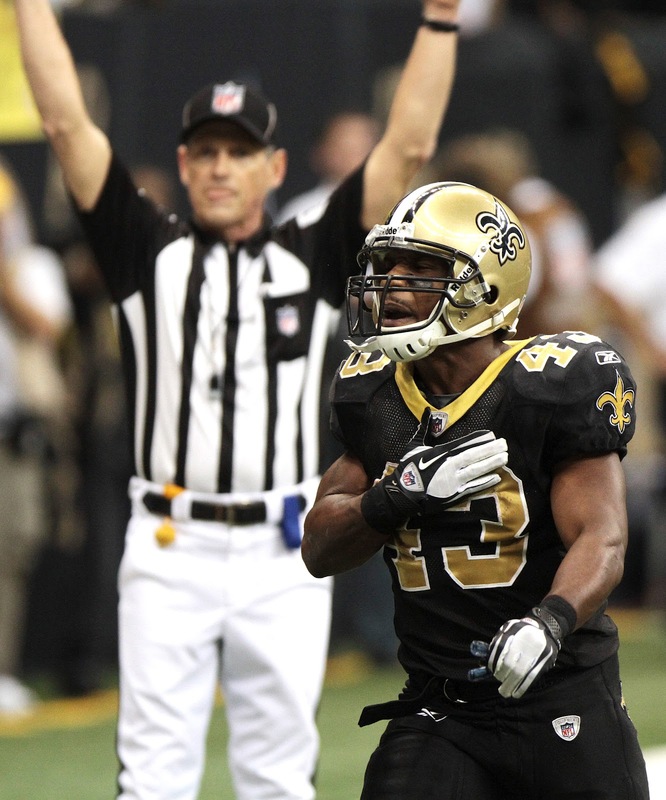 In 2011 the Saints scored 62 offensive TDs, one fewer than the Packers league-leading 63. Of those 62 TDs, nine different Saints players scored multiple offensive TDs. This not only tied for the league-lead (Lions), it exceeded the totals of teams like the Packers (7) and Patriots (6) who scored at will last season much like the Saints did. While the likes of Rob Gronkowski (18 TDs), Calvin Johnson (16), and Jordy Nelson (15) led their clubs in TDs, Jimmy Graham produced the Saints' highest output at a more modest 11 TDs. This is a good thing. It not only makes the offense less prone to a production drop-off due to injury, but it also complicates matters for opposing defenses trying to neutralize scoring threats. To wit, the Saints' top-two TD producers in 2011--Graham and Sproles--accounted for just 32.2% of the team's total offensive TDs. Contrast that to Gronkowksi and Calvin Johnson, individually, accounting for 32% of his respective team's offensive TDs. Among the eight highest-scoring teams in the NFL last season, the Saints' top scoring tandem of Graham/Sproles accounted for the lowest overall percentage of offensive TDs. Again, this is good. Think about it for a second. The Saints scored 42% of their offensive TDs in 2011 with what one could consider the Saints "5th option" and beyond. That is staggering. The 26 TDs the Saints' offense scored outside of their top-four producers were still more than the offensive TDs posted by STL, KC, CLE, JAX, and IND. And this is what makes the Saints' offense better than the NFL's other great offenses: unrivaled diversity. It's a philosophy of "more." The more the options, the more the personnel packages, the more the variety of formations, the more the stress imparted upon opposing defenses. While the Saints' offense might resemble a socialist model in its distribution tactics, paradoxically, greed rules the day. So as Saints' fans rightfully debate the popular "Ivory vs. Cadet" topic about who's better suited to being the team's 4th RB, it's important to note "role" and remember "options." While at first glance Cadet's skill set might seem ideally suited to the Saints' offense and special teams, Ivory offers a specialized skill that's in short supply on the roster. Further, Cadet's pass-catching ability--probably his best "skill" at this point--duplicates that of Sproles', PT's, and Ingram's, thus rendering Cadet's overall value a bit less relevant. Though it's ultimately a moot point because both players will likely make the roster--assuming the Saints decide to break with last year's decision to carry two fullbacks--the larger point is that Ivory should not be so easily and suddenly dismissed because he's considered a one-dimensional "power back." His value to the Saints' offense is precisely connected to that dimension--one that ensures maximum diversity in the offensive arsenal and one that the Saints surely prize. And finally, this leads us all the way back to Robert Meachem. Replacing Robert Meachem is not quite the simple task that many people have apparently made it out to be. First of all, the role of a "4th WR" in the Saints' offense is not one of marginal relevance. Further, attaching Meachem's significance to that of a "4th WR" is a lazy oversimplification. Meachem played more snaps than any other WR on the team last season; he was much more than just a situational player. And his replacement in 2012 might be thrust into the same role if circumstances dictate. While Meachem wasn't central to the offense's success like Graham, Sproles, and Colston were, he was nevertheless valued: he knew the playbook; was a reliable run blocker; and specialized as an excellent deep threat. Since '09 Meachem has averaged 15.4 yards per reception. This ranks 12th in the NFL, and Meachem's Y/R eclipses that of Devery's during the same time span. It's not going to be as simple as "plugging someone in"; while Meachem himself might not be critical to the offense, the execution of his role certainly is. So who will replace him? As of now, it's probably a combination of Courtney Roby and Joe Morgan. Nick Toon hasn't practiced in weeks due to a chronic foot injury; Adrian Arrington is rehabbing from knee surgery; and Andy Tanner suffered what appeared to be a high ankle sprain in last week's game. Whoever gets Meachem's snaps is faced with replacing one of the league's better deep threats and one who was trusted by Payton in every offensive situation. Regardless of who ultimately wins the job, it's critical that Meachem's role be executed in a manner that allows the Saints offense to function with similar efficiency. If the Saints intend on maintaining the best-ever offensive form they unleashed on overmatched defensive opponents in 2011, then ensuring that their multi-dimensional model is fully intact is of utmost importance in 2012. I would love to see Courtney Roby get a shot. The guy has earned it. Roby has played great this preseason. He's going to get playing time, at least early in the season. I'm not sure Carmichael fully trusts Morgan yet, and everyone else is hurt. I'm guessing Morgan will be a one-trick pony (deep threat) for the most part.